THE MOUNTAIN ROAD BETWEEN LAC LITCHFIELD RD AND HWY 301 NORTH WILL BE CLOSED FOR REPAIRS FROM JULY 16 TO JULY 26, 2018. Persons interested will be able to consult the 2018 Provisional Budget at the municipal office situated at 1362 rte 148 Campbell’s Bay, Qc J0X 1K0 during regular business hours. 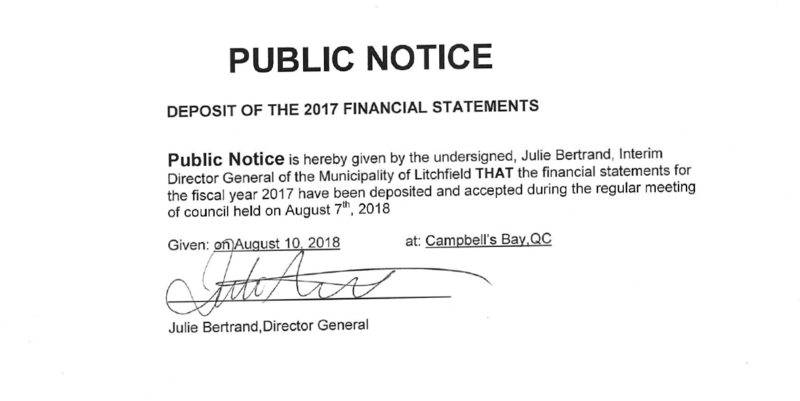 Persons interested will be able to consult the By-Law at the municipal office situated at 1362 rte 148 Campbell’s Bay, Qc J0X 1K0 during regular business hours. 2018-234 to amend By-law number 2011-009 concerning the Code of Ethics and Deontology for elected officials. The Draft By-law is available for consultation at the municipal office of Litchfield situated at 1362 route 148 Campbell’s Bay, Quebec, from Monday to Friday from 8:30 a.m. to 12 p.m. and from 1 p.m. to 4 p.m. The transfer site will be closed on December 25, 2016 and January 1, 2017. 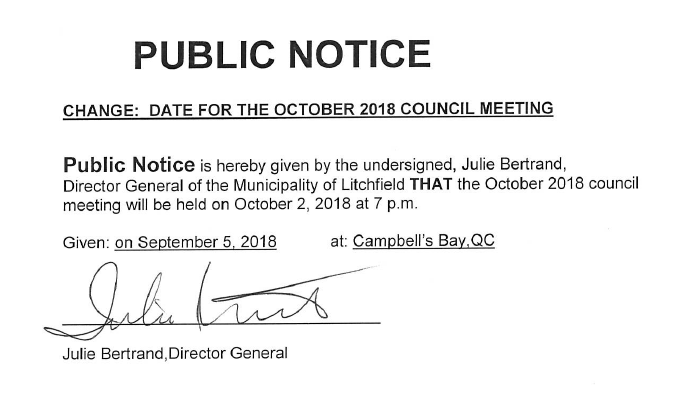 Public Notice is hereby given by the undersigned, Julie Bertrand, Interim Director General of the Municipality of Litchfield THAT the financial statements for the fiscal year 2014 have been deposited and accepted during the regular meeting of council held on October 5, 2015. 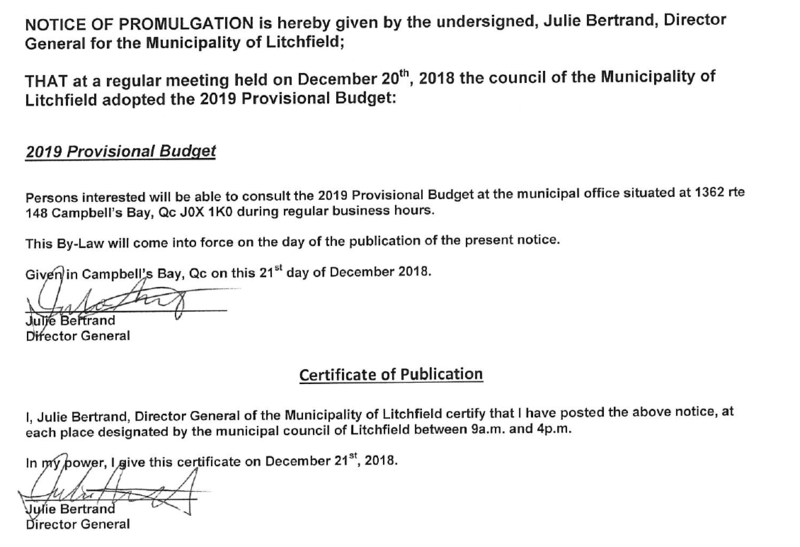 DEPOSIT OF THE REAL ESTATE ASSESSMENT TRIENNIAL ROLL OF THE MUNICIPALITY OF LITCHFIELD FOR THE 2016, 2017 AND 2018 PERIOD. 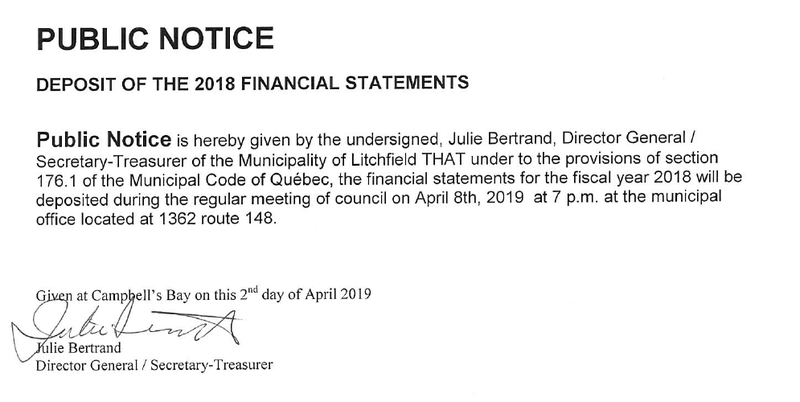 THAT the real estate assessment roll of the municipality of Litchfield for the 216, 2017 and 2018 period (triennial roll) has been deposited at my office on September 15,2015. THAT anyone may consult the roll at their convenience during the opening hours of the municipal office. A revision request as provided in Section 1 of the Chapter X of an Act respecting municipal taxation must be filed before May 1st, 2016. A revision request must be filed on the form made to this effect and accompanied by the amount of money prescribe by the By-law number 47-97, otherwise, it will be assumed that the request was not deposited. The form and the By-law number 47-97 are available at the MRC Pontiac. The filing of the request is made when the form mentioned, duly completed, is handed or sent by registered mail to the “MRC” to the care of the secretary of the MRC. When the request is made by the handling of the form duly completed, it is reputed to have been deposited on the day of its reception. When the request is sent by registered mail, the request is reputed to have been deposited on the day it was sent. Become a Red Cross volunteer : Join our emergency response team in the Pontiac region! Red Cross volunteers assist victims of disasters such as fires and floods. They are ready to respond at any time, to provide emergency support, comfort and emotional warmth to those who have been affected. > you will receive accredited training in first aid and emergency response. FROM 9AM TO 4PM ON THURSDAYS AND SUNDAYS. DECEMBER 4, 2014 TO APRIL 1ST, 2015. A public meeting to present the 2015 Municipal Budget will be held on December 11, 2014 at 7pm at the municipal office located at 1362 rte 148 Campbell’s Bay, Qc. The Municipality of Litchfield is revising the LIST OF CIVIC ADDRESSES WITHIN OUR TERRITORY. Please VERIFY YOUR CIVIC NUMBER WITH YOUR TAX BILL. If you find a DISCREPANCY between the two, please contact the office immediately. IF YOU DO NOT HAVE A CIVIC # PLEASE NOTIFY THE OFFICE IMMEDIATELY and we will ISSUE ONE. Please NOTE THAT THERE ARE NO CHARGES FOR UPDATING OR ISSUING A CIVIC NUMBER. THANK YOU FOR YOUR COLLABORATION. The municipality would like to remind taxpayers that they are responsible for the control of beaver dams on their own property. It is also noted that a person may be held responsible for damage caused to other properties, as a result of flooding from beaver dams. M. Roy Bertrand , Professional Trapper at 819 683 3452.